In this recent story over at CBS New York that the Drudge Report linked to on Wednesday they report upon a new mystery in the New York area, bizarre metal tower structures that are popping up at local tunnels in the region that they report will soon be appearing at bridges, too. A $100+ million project shrouded in secrecy with even MTA board members saying they don't know enough about them, it's quite obvious that these mysterious structures are the latest part of the Homeland Security apparatus here in America as we hear from David Knight of Infowars in the 1st video below. With MTA chairman Joe Lhota giving us the biggest hint about what these behemoths are by claiming "the base of these new pieces that are going up include whatever fiber optics are necessary for those Homeland Security items”, we hear in the 2nd video below why these towers are the latest steps towards 'Skynet' coming to completion in America. 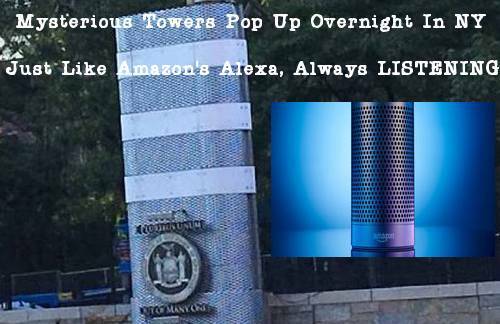 And as we learn in more detail below, it appears these towers are equipped with devices that can be used for crowd control via the usage of 'ultrasonic sound waves' as an an array of piezo-electric transducers within these towers can be seen in the final video below from CBS News New York reporting upon these towers now popping up across the region. And while Lhota claimed he was unable to discuss the question "could they contain facial recognition? ", it's quite clear that not only do they have such tech but they also harbor massive recording technology, a massive 'Alexa' on steroids, listening in and recording every conversation within hundreds of feet or even miles. With the bottom half of the towers looking almost like a gigantic microphone and 'big brothers' ever present habit of trying to watch and listen to everything, everywhere at the same time, we see in this new story from Defense One that Steve Quayle linked to on his website on Thursday that warnings of Skynet are becoming closer to reality every day. Leaders of the Air Force, Navy, Army and Marines are converging on a vision of the future military: connecting every asset on the global battlefield. That means everything from F-35 jets overhead to the destroyers on the sea to the armor of the tanks crawling over the land to the multiplying devices in every troops’ pockets. 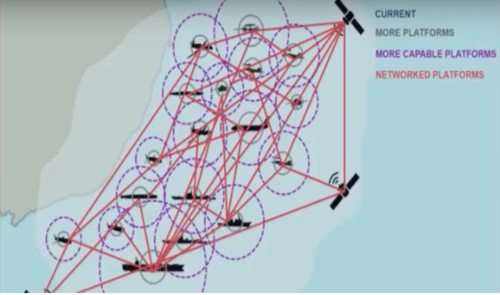 Every weapon, vehicle, and device connected, sharing data, constantly aware of the presence and state of every other node in a truly global network. The effect: an unimaginably large cephapoloidal nervous system armed with the world’s most sophisticated weaponry. Making the entire system absolute ripe for abuse, how long might it be before the entire system was either hacked and turned against America or the 'central brain' determines that humans are the threat that needs to be 'eliminated'? 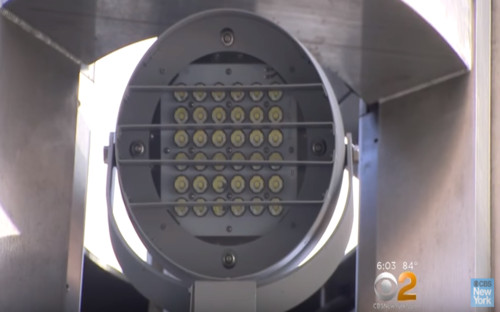 As Live Science reported all the way back in 2013, Intellistreet lamps have the ability to capture video and audio of street scenes and they were already being used in Las Vegas. Think these monster towers don't have at least the same capabilities? They look like ordinary streetlights, shining down on Las Vegas sidewalks after the sun has set. But Sin City's new streetlights have a few special capabilities that have civil libertarians up in arms. The city is installing Intellistreets, a brand of street lighting that is capable of recording video and audio of pedestrians and motorists. What happens in Vegas, it seems, no longer stays in Vegas. "We want to develop more than just the street lighting component. We want to develop an experience for the people who come downtown," Neil Rohleder of the Public Works Department told NBC News affiliate KSNV. The lamps are equipped with large video monitors that display ads or other messages, and speakers that broadcast music or voice messages. 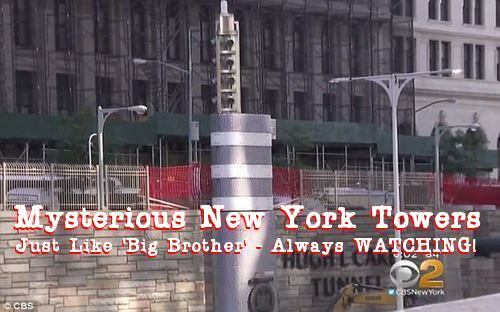 But people like civil liberties advocate Daphne Lee have concerns that Big Brother is watching — and recording. "This technology is taking us to a place where you'll essentially be monitored from the moment you leave your home until the moment you get home," Lee told KSNV. With these new towers giving 'the watchers' another way to 'watch', they also give millions of Americans another reason to stay as far away from the big cities in America as possible, as if we didn't have enough reasons with the cities having overwhelmingly voted for Hillary Clinton while often being the home of 'snowflake central' in America. If thats what they really are then it can only be for one thing; using ultrasonic sound waves for crowd control. Ultrasonic sound waves at such a power level could, and very likely would, cause very horrible irreversible ear damage. Looks like its time to invest in some high quality ear plugs folks. As we reported on ANP back on September 13th, several different experts have come out recently warning of an AI induced global apocalypse with devious new weapons of mass destruction that will kill without consequence or remorse. As we reported then, back on August 21st the Daily Mail reported in a story titled "We need to shut Pandora's Box': Elon Musk leads 116 experts calling for a BAN on killer robots that they claim could be the 'new weapons of mass destruction" that we may soon witness 'global instability' brought about by the use of 'killer robots' if left unchecked. Are we about to witness 'the rise of the machines'? Such a 'rise', experts warn, could quickly bring about the 'end of humanity'. Killer robots should be urgently banned before a wave of weapons of mass destruction gets out of control, industry leaders say. Robotics and artificial intelligence experts have signed of an open letter demanding the UN prohibit the use of such weapons internationally. Among the 116 signatories are Tesla founder Elon Musk and Mustafa Suleyman, head of applied AI at Google's Deep Mind. The weapons, including lethal microdrone swarms, are on the edge of development with the potential to create global instability, they warn. It warns the Fifth Review Conference of the UN Convention on Certain Conventional Weapons that automated warfare represents a 'third revolution' in armed conflict, following on from the advent of gunpowder and nuclear arm. 'These can be weapons of terror, weapons that despots and terrorists use against innocent populations, and weapons hacked to behave in undesirable ways. 'We do not have long to act. Once this Pandora's box is opened, it will be hard to close.' Technology allowing a pre-programmed robot to shoot to kill, or a tank to fire at a target with no human involvement, are only years away experts say. With cell phone towers popping up on virtually every block in California providing an undercover strategy for comprehensive surveillance according to this recent story from Natural Blaze while Google AI bots recently went on a virtual killing spree, slaughtering numerous Conservative-thought YouTube channels, its easy to see where this is all going. And that 'Pandora' has already been let out of 'the box', with no known ways to recapture the uncontrollable monster now that its been unleashed.